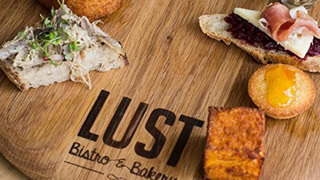 The Lust Bistro and Bakery is located on the beautiful Vrede en Lust Wine Estate on the outskirts of Franschhoek (the gourmet capital of South Africa). At the heart of Lust Bistro and Bakery is a hearth: the traditional, wood-fired brick oven where patron Jean Pierre Smith conjures up authentic artisan breads and all manner of delectable daily fare. As everything is freshly prepared in the bakery every morning, Lust Bistro and Bakery has become a very popular spot to enjoy a wonderful breakfast in Franschhoek with an extensive menu on offer. Simply put, Lust Bistro offers the best breakfasts in the winelands. As you enter the bakery at Lust, the aroma of freshly roasted coffee is in the air, while freshly baked cakes ready to be ordered can be seen in the displays. Lust is the perfect venue for a quick business meeting or a catch-up session with friends and family. Bistro-style, the lunch time chalkboard changes daily, depending on what’s in season and what the weather calls for. The cheese and charcuterie platters, laden with delicious South African produce and Lust’s artisan breads, are heavenly. When you meet Jean Pierre Smith, you realise that underneath his soft-spoken manner and quirky smile, there hides a dangerously sharp mind. Patron chef and baker extraordinaire at Lust Bistro and Bakery, Jean Pierre dreams up dishes that embody his ultimate vision for food: simple, fresh and without pretence. Free Wi-Fi is available at Lust Bistro.